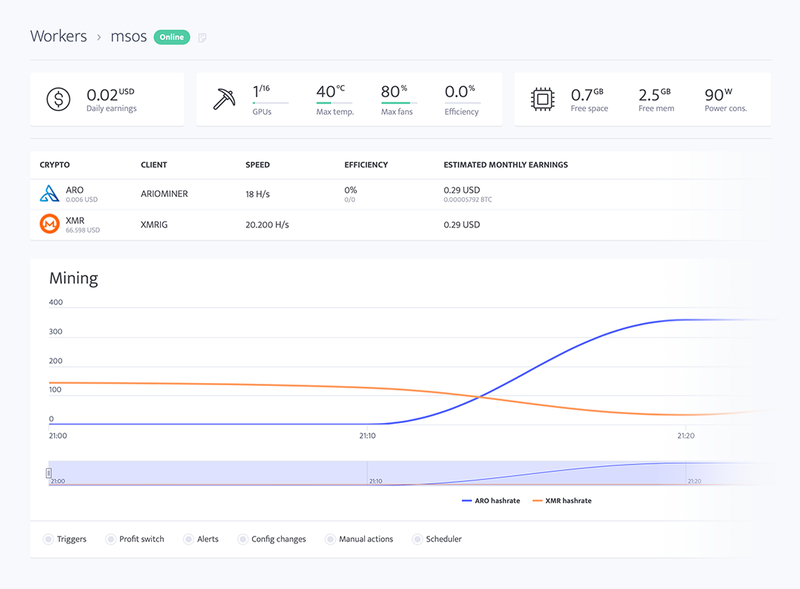 💡 While the second step is very straightforward and its difficulty is not much different than using the minerstat dashboard, the first one requires some development and programming knowledge. In this tutorial, we will show you an example of how to create a package for implementing ArioMiner. 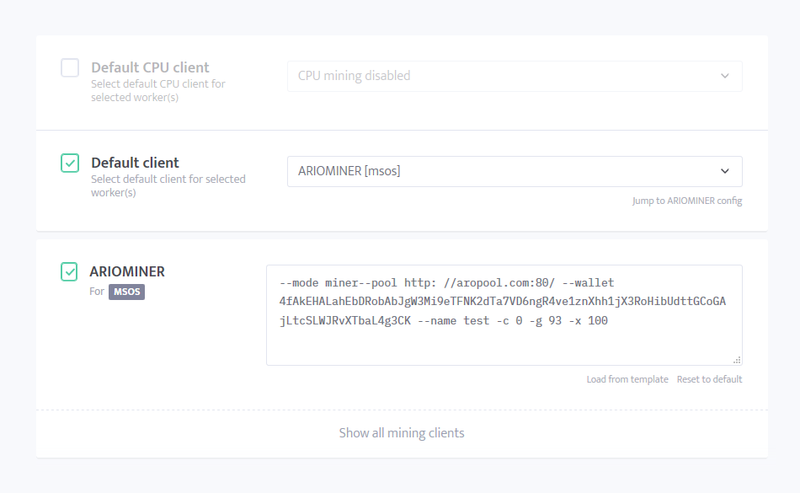 We decided to use this miner as an example as it was previously suggested for implementation by one of our customers and the fact that ArioMiner doesn’t use JSON API for reporting. From the point of mining management software, it is really welcome of mining client developers to provide a JSON API. 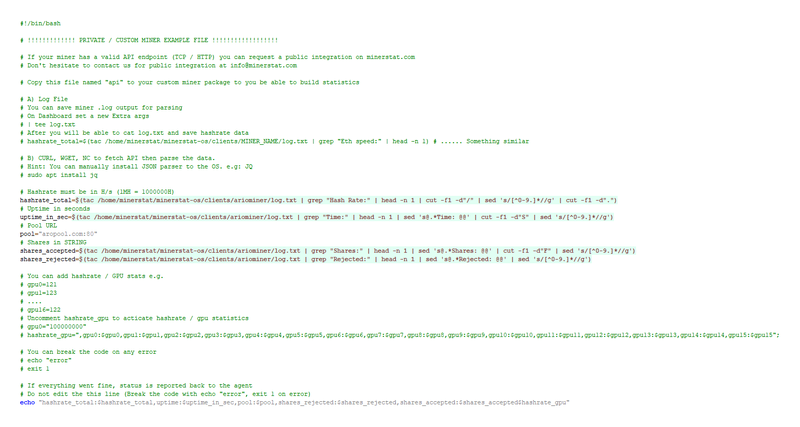 From this example, you can see that you can use minerstat mining OS even if there is no JSON API report. The first is executable mining client with all necessary files and the second is a modified api file. Since ArioMiner doesn’t report the results, we will enable logging that will save some of the data to log.txt file. The API bash script will then read the data that is available in the log.txt and serve it in the required format. If you will be implementing any other mining client, its approach might be different and the data will need to be read differently. Let’s take a look at the api file. To read the hashrate from the log.txt file, the following code is used. Please note that hashrate must always be provided in H/s (1 kH/s = 1 000 H/s; 1 MH/s = 1 000 000 H/s; 1 GH/s = 1 000 000 000 H/s; and so on). To read the uptime in seconds from the log.txt file, the following code is used. Please note that uptime must always be provided in seconds. Unfortunately, log.txt doesn’t report information about the pool. Because of this, we have to enter the pool data manually. To read the accepted and rejected shares from the log.txt file, the following code lines are used. At the end of the file, the following format must stay unchanged. Without that last line, the data would not get processed and sent from msOS to your minerstat dashboard. So, when you have both mining client executables and API file ready, you can compress them in a .zip or .tar.gz and upload it to your selected server (even local one that is accessible only from the rig). The next step is to add the mining client to the dashboard. Navigate to the custom clients page. Click on the button to add a new mining client and enter all necessary information. Each mining client requires the following information: name, package URL, executable file name, client config type, client args/config, and extra args. For ArioMiner example we will add the following information. The name is used on the dashboard, worker’s config, profit switch, config templates, and scheduler. The URL to your mining client. It can also be a local URL or URL that is accessible only from your rig which assures you maximum possible privacy. The first file you have created in the first step of this tutorial. The name is case sensitive. 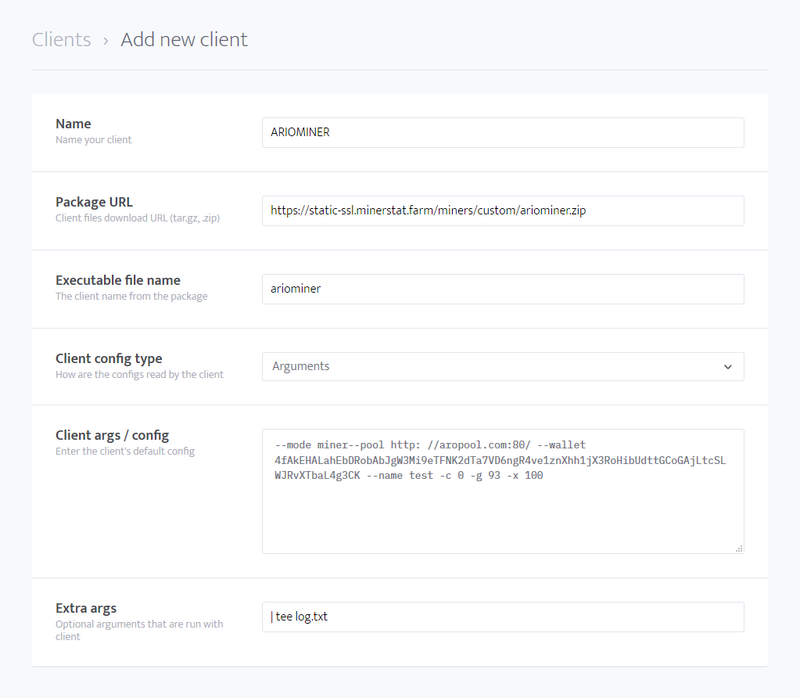 If your mining client reads configs from the external file, select Config file and if your mining client reads configs from arguments, select Arguments. Provide default config for your client. Define extra arguments that will be called on the client run. We will enable logging by adding an extra argument as defined below. This will allow API bash script to read the information about hashrate, uptime, and rejected and accepted shares. When you have entered all of the fields you can click Save. The next step is to navigate to the worker’s config page and select your new mining client as a default mining client. All custom mining clients are denoted with blue color. Enter your configuration and save changes. You are now mining with your new, custom mining client.